We have discussed that healthy fats are accepted in the Paleo diet. Fats don’t necessarily mean that it can make you fat. There are health benefits that we can get from them too. We have gone through most of the healthy fats in our previous posts. And it’s about time we talk about oils. It is essential to choose the right kind of oil to be included in your diet to improve health from inside out. But as what Mark Sisson said, not all oils are created equal. Sure there are lots of edible oils around which are very healthy and rich in vitamins and minerals. But there are also those which are not so good and can harm the body. Paleo approves only healthy and natural oils. Yes you can say that there aren’t really naturally occurring edible oils. But we always have the option to choose the most natural we can get. This means unprocessed or has not undergone chemical procedures. Along with the other healthy fats, coconut oil is one of the staple foods of the Paleo followers. It is made up of mostly saturated fats (90%). We already know the truth about saturated fats so there’s nothing to be afraid of. Coconut oil is a great energy source and it contains medium chain triglyceride (MCT), a special type of saturated fat which does not require bile acids for digestion. It can easily be absorbed. It has anti-bacterial and anti-inflammatory properties. Since it is very high in saturated fats, it is the best option for cooking especially in high heat. Olive oil has been one the super foods and is Paleo-approved. It is mostly composed of monounsaturated fats. 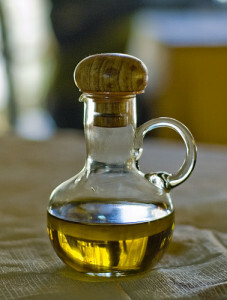 It can be used as cooking oil and even incorporate to some dishes such as in salads. It is fairly resistant to heat and less prone to rancidity. Extra virgin olive oil has the most benefits to offer. It is high in antioxidants, anti-inflammatory and anti-cancer properties. Macadamia oil is derived from pressing the macadamia nut. The quality of this oil is quite similar to the finest extra virgin olive oil. It is made up of mostly monounsaturated fats and has a fairly high smoke point of 390°F. It is ideal for sautéing, frying, baking and broiling. Palm oil is tropical oil next to coconut oil made from the flesh of the palm fruit. It is mostly saturated fats which makes it less likely to oxidize. Red palm oil is the best option as it contains nutrients such as vitamins A, E and C0Q10 (helps in cellular respiration) and antioxidants. Walnut oil is yellowish in color with a nutty flavor and aroma. It is mostly polyunsaturated and has a high smoking point too. But it is more perishable than other oils. Sesame oil has a very good taste especially in toasted variety. Asian dishes normally have sesame oil incorporated. Unrefined sesame oil has lots of antioxidants which can minimize oxidation. It is the most shelf-stable seed oil around. Though it is true that sesame oil is high in Omega 6, the abundant antioxidant contents of it has a plethora of benefits to offer. Fish oil has been considered as one of the good fats. The Omega 3 fatty acids content of fish oil is very beneficial to one’s health especially in promoting cell functions, insulin sensitivity and good lipid numbers. It is normally used as supplement rather than in cooking. Corn oil is mild to medium yellow in color. It is refined oil made from the germ of corn kernel. It is mostly polyunsaturated and high in Omega 6. It has a smoke point of 450°F. Light gold in color, canola oil comes from rapeseed, a seed which is bitter and high in erucic acid and can be toxic. It has gone through a lot of processes before it becomes canola oil. Think about chemical processes such as deodorizing, bleaching and acid addition! Not to mention the disproportion rate of Omega 3 to 6. Peanut oil is a vegetable oil derived from peanuts. It has a strong peanut flavor same with sesame oil and has a mild sweet taste. It is yellowish in color. It has a high smoke point of 446°F that makes it best for high heat cooking. Because of its high polyunsaturated fats, it can easily oxidize and turn rancid. Vegetable oil is definitely non-existent during the pre-historic era. Technology is used to be able to produce it. Vegetable oil has been used for cooking for some time now. It is made from combining several refined oils. It is designed to have a mild flavor and high smoking point. Soybean oil is most of the time partially hydrogenated. The ratio of Omega 3 to 6 in soybean oil is highly not proportion that can lead to some inflammatory diseases. Sunflower oil comes from pressing the sunflower seed. It is very high in polyunsaturated fats with little to no Omega 3. It has a very high smoke point. Safflower oil is much like sunflower oil; only the oil is derived from saffron which is high in polyunsaturated fats. It contains 75% Omega 6 without Omega 3 to balance it out. It is refined oil and definitely not Paleo. Healthy oils especially those that come from fruits and seeds are considered Paleo. All other oils that are refined and processed are absolutely to be thrown away. The things to be considered in choosing the right and healthy oil for your diet are saturated fat contents, balanced Omega 3 to 6 ratio, heat stability, origin (natural or processed) and of course the nutritional value it offers. What Experts Say About Oils.. Are They Paleo? Serious Eats. Cooking Fats 101: What’s a Smoke Point and Why Does it Matter?